"Horror is what should not be, but is." I've got huge amount of time for Guillermo del Toro. It's not just that he's a genuinely great filmmaker with a startling imagination and consummate storytelling skills, or that he is such an enthusiast for his craft and the genre in which he specialises, although this would be enough. It's just that in every interview and every second of behind-the-scenes footage that I've seen of him he comes across as a genuinely lovely man and an absolute joy to work with. I'm not going to claim that I've adored everything he's done. I still find it hard to get too excited about his second feature Mimic (a film he himself has unhappy memories of making) and I was left completely cold by the Hellboy films and their animated spin-off. But it's hard to complain when this fine man was also responsible for one of the most original vampire films in the past twenty years, for a brilliant melding of gothic ghost story and Spanish political history, for one of the most enjoyable sequels in modern horror cinema, and for an extraordinary adult fairy tale in which a young girl finds refuge from the evils of Spanish fascism in magical underground labyrinth. In the UK at least, del Toro's films were sometimes unevenly served by their first DVD releases. Cronos fared particularly poorly, being first released with a cropped 4:3 transfer, then with a shoddy NTSC to PAL conversion whose picture was soft and dark and lacking any real shadow detail. 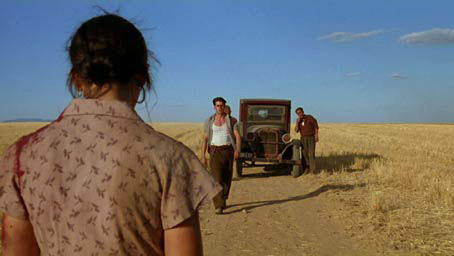 The picture quality on the UK release of The Devil's Backbone was a lot better, but the first DVD release had a letterboxed rather than anamorphic transfer, which doesn't really cut it on a 42" plasma. Owners of multi-region DVD players could always buy the TVA Canadian release of The Devil's Backbone, which boasted a solid anamorphic transfer, a fine 5.1 soundtrack and del Toro's first ever commentary track, recorded here in conjunction with cinematographer Guillermo Navarro. 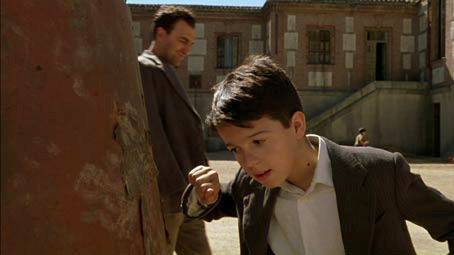 The picture quality was similarly impressive on Lion's Gate's American DVD release of Cronos, but an oversight with the subtitling meant that the English subs for the Spanish language sequences were copied directly from the hearing impaired subtitle track, meaning that the dialogue translations were accompanied by information about music and sound effects. In 2007 Optimum released the 3-DVD Guillermo del Toro Collection, which consisted of Cronos, The Devil's Backbone and Pan's Labyrinth – the same three films the make up this new Blu-ray collection – and I wish I could tell you whether this put right the earlier wrongs, but having bought the two above mentioned North American discs and the 2-disc UK release of Pan's Labyrinth, I had no good reason to cough up for a new set. At first glance it may seem that this new Blu-ray collection, also from Optimum, is simply a high-definition version of that DVD set, and not having access to the DVDs I can't testify to the similarity of the extras in the two packages, but there are definitely a couple of new additions on the HD release and two of the three titles are more feature rich than the earlier stand-alone DVD releases. More importantly, all three films have been remastered in 1080p high definition, and with a couple of small caveats, the results are impressive. We've already reviewed all three films in this set for their earlier DVD or cinema releases, and rather than reprint the reviews here I've provided links to those articles under each title. Where an extra feature has been ported over from a previously reviewed disc, the comments made in those earlier review have been recycled and adapted for this release. All three discs have similarly designed HD menus that, although visually attractive, respond to commands like they've been soaked in treacle. Click here to read our review of the film and a comparative view of the Lion's Gate and Optimum DVDs. If the only DVD you have of Cronos is the above-mentioned Optimum release with its grubby, standards-converted transfer, then the picture quality here is going to come as something of a revelation. 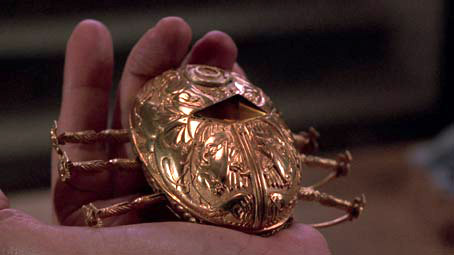 Even compared directly to the Lion's Gate DVD this is a notable upgrade, offering far greater level of detail, something immediately evident in the early close-ups of the Cronos device, which actually looks a little soft on the DVD by comparison. It also displays a more subtle and naturalistic colour palette and a nicely balanced contrast range that, with a couple of night-time exceptions, doesn't sacrifice shadow detail to get the black levels about right. 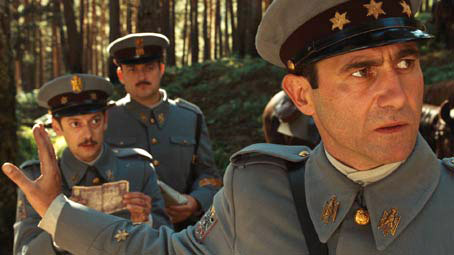 Little of the film takes place in bright sunlight, but the picture doesn't suffer when the light level drops. Of course those with multi-region Blu-ray players will have access to the Criterion BD release in December, but there are no major deficiencies here and it's as good as I've yet seen the film look by a considerable margin. My only real gripe is the same one I have for all of the transfers here, that they've been framed 1.78:1 rather than then original 1.85:1. There's a choice between stereo 2.0 LPCM and 5.1 DTS-HD Master Audio, and while the stereo is good, the DTS-HD has more body and subtlety, even if the sound does sit resolutely at the front. There is some distinct separation on both tracks, and it's best not to go expecting the punch of the soundtracks you'll find on modern Hollywood products, but otherwise this is a solid job. The motion of the cogs inside the Cronos device sounds lovely on both tracks. The commentary here is the same as the one on the 2006 Optimum disc, but that's no bad thing, being a typically fascinating chat that's loaded to the gills with interesting anecdotes and enlightening background detail, including the concept of 'living jewellery', the problems of test screenings and the American movie production system, and the suggestion that the Mexican film industry is (or was) corrupt and controlled by a collection of little cinematic mafias. It also has typically great del Toro quote: "I have learned more from pain than I have ever learned from success." Also reproduced from the 2006 Optimum disc is this hour-long Spanish language interview that covers a good deal of ground, from the director's early days with 8mm to his entry into professional filmmaking, plus a fair amount on the various influences on Cronos, which include Terence Fisher, Frankenstein, German Expressionism, David Cronenberg and Clive Barker. There's also plenty on the film itself, on the casting, the selection of Guillermo Navarro as cinematographer, the music, the sound effects, the budget, and the general reaction to the finished film. There is some duplication with the commentary, and there are no cutaways to film extracts or stills, but del Toro is such an interesting talker that it's never dull for a second. A newly recorded interview with the director that seems to have been designed as a direct companion piece to the above, at least if the almost identical running time is anything to go by. Inevitably there is some crossover with the previous interview and the commentary, but once again del Toro proves a captivating storyteller, covering how he got into filmmaking, how the story for the film was conceived, the design and construction (and later theft) of the Cronos device, his key influences, his love of Polanski and European horror, the process of creating characters, the influence of gothic literature and loads more. As ever the interview is sprinkled with quotable remarks, one of my favourites being, "Socially the family is a strange invention – it can be a torture machine or a raft." 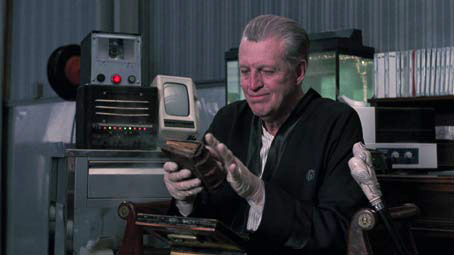 Also from the earlier Optimum DVD and shot on the same spot as the original del Toro interview, the Cronos cinematographer describes how he got involved with the film, talks about the experience of working on it – which he refers to as dynamic and enriching – and what it's like to work with del Toro. Based around an interview with Federico Luppi and peppered with behind-the-scenes footage, this is brief but interesting, though visually a little below par for a Blu-ray extra. It's all about the content though, and that makes its inclusion worthwhile. This has also been borrowed from the earlier DVD. Loosely based on a story by Frederic Brown, this 1987 short provides a welcome peek at del Toro's pre-feature film work as writer-director, a seductively quirky tale of a boy who, fed up with failing geometry, summons a demon and pays the inevitable price. Visually quite striking and in very good shape, it appears to have been shot mute and the dialogue post-dubbed – I may be wrong, but I'm guessing that all of the voices were provided by del Toro himself. It's in really good shape as well, and presented in 1080p. Click here to read our review of the film and the Canadian DVD release. Once again comparing the Blu-ray with the previous DVD release reveals a very visible improvement in picture detail, and I'm using the anamorphic transfer on the Canadian TVA disc for reference. Picture elements that were soft on the DVD are really crisp here, and there's a richness to much of the image here that outstrips the DVD in every respect. The golden tone to the interiors has been toned down a little and film grain is sometimes quite evident in dimmer scenes. Sometimes the contrast is a little unforgiving on shadow detail, but on the whole this is a fine transfer and a worthy HD upgrade. Once again you can choose between LPCM 2.0 stereo and 5.1 DTS-HD Master Audio surround, and as with the DVD the surround track wins out, with the explosions really packing a serious wallop and the subjective reproduction of Casares' deafness via the subwoofer every bit as uncomfortable to the inner ear as it was on the earlier release. The only commentary in the set that I didn't recognise from an earlier DVD, though it may well have been recorded for the aforementioned Optimum DVD set – the references to Pan's Labyrinth date it as post-2006 and the director introduces it as being for a UK release. Either way, it's another consistently fascinating and info-crammed listen, as del Toro provides a detailed breakdown of the structure of a typical gothic romance, and covers a broad range of subjects in an always engaging and often enlightening manner. These include his preference for flawed heroes and three dimensional villains, the influence of Dickens, De Sade ("the divine Marquis," as he calls him), Mario Bava and Nigel Kneale, how the experience of making Mimic left him damaged, his use of camera movements and long single shots, the autobiographical elements and influence of his school days ("Going to Jesuit school is as close as I can imagine to going to prison"), the design of the ghost, and loads more. There are some enjoyable anecdotes, including his first festival meet with Pedro Almadóvar and the hasty rebuilding of a set that was destroyed by a tornado, but my favourite stories surround the methods he employed to prompt more extreme on-screen reactions from his young cast, including telling one he couldn't act to bring him to tears and stuffing ice into the pants of another to make him shiver. "I should go to jail," he remarks in amusement. A brief introduction by del Toro to this Blu-ray edition. What looks like the original Spanish EPK includes some on-set interviews with cast and crew members and quite a bit of behind-the-scenes footage. Though less thorough than a straight-up documentary, it is still of real interest and well worth a look, after you've seen the film at least. This was also on the Canadian TVA DVD release. Special Effects are subdivided into two sections, Aerial Bombardment (6:39) and The Ghost (6:04), both of which provide a fascinating and commentary-free breakdown of how some key effects shots were constructed and how the filmed elements, mattes and CG effects were combined. The same nicely assembled trailer as the one on the Canadian DVD. 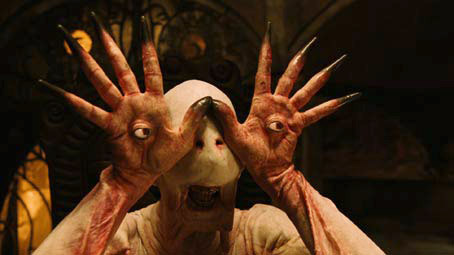 Del Toro talks about how the film came to be, the development of the story, the influence of gothic romance and the structural, thematic and character similarities to Pan's Labyrinth. Nicely drawn storyboard sketches that are set to the soundtrack of the four sequences they cover. There are also up-to-date Biographies of Guillermo del Toro, Guillermo Navarro, Marisa Paredes, Federico Luppi, Eduardo Noriega and del Toro's production company The Tequila Gang. Click here to read our review of the UK cinema release of the film. 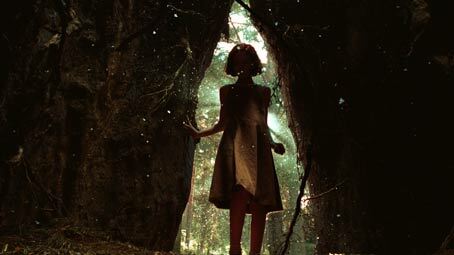 As the most recent of the films in this set and the one with the biggest budget, it's natural to expect Pan's Labyrinth to look the best on Blu-ray, and for the most part it does. There is some slight greying of blacks in some of the darkest scenes – and there are some very dark scenes in this film – and the contrast is occasionally a little harsher than need be, but get the characters out into the forest in daylight and the level of detail and filmic richness of the picture is genuinely eye-popping, something really emphasised by direct comparisons with the DVD. The HD image also has far better integrity in the darker night time and underground scenes, allowing the detail of the production and creature design to really shine through. Once again there's a choice between LPCM stereo 2.0 and 5.1 DTS-HD Master Audio and the difference between them is more evident here than on the other two discs, the 5.1 track making lively and atmospheric use of the full sound stage (when Vidal shouts to the rebels in the forest, for example, the echo of his words resonates convincingly behind your head, and the fluttering of the green fairies will have you looking repeatedly over both shoulders) and boasting a lovely clarity and range. The sound design in the underground world really help bring it to life, while real world atmospherics like rain are vividly and inclusively reproduced. A lovely track that is integral to the film's audio-visual identity. Save for one, all the extra features here have been ported over from Optimum's earlier 2-disc DVD release, but some have been remastered in HD. Another fine commentary, again stuffed with information on the film and its background, including the themes explored, the differences and similarities to The Devil's Backbone, the origins of the story, the director's hatred for writing dialogue and preference for visual storytelling, the use of colour filtration, the design and mechanics of operating the creatures, the portrayal of violence, the accuracy of detail and the historical elements, and tons more. There are some typically interesting anecdotes, including how the 11th September attacks and being the victim of assault had an impact on the film, and how a slip-up by an actor was corrected by substituting his head with a digital equivalent (you're encouraged to use the pause button to see if you can spot it). A brief introduction to the DVD version in which del Toro describes the film as the most personal movie he has yet made. Interviewed at the National Film Theatre by Mark Kermode, del Toro is as entertaining as ever and covers plenty of interesting ground, including links between Pan's Labyrinth and The Devil's Backbone (this does turn up a lot), the decision to set both films in the Spanish Civil War, the uterine elements of Pan's Labyrinth, the influence of his own childhood memories, his lapsed Catholicism ("I feel guilty even when I'm sleeping") and the inherent Mexican distrust of institutions. He reveals that the two most harrowing experiences of his life were the kidnapping of his father and working with Miramax, and amusingly but perceptively compares the encroachment of evil to the growth of mildew. The sound recording is a little tinny but the dialogue can all be heard. Del Toro discusses the appeal and creative possibilities of fairy tales and gives a detailed breakdown of they manifest themselves in the structure and characters of the film. The only extra exclusive to the Blu-ray provides brief animated comic book background snippets to four of the underground characters. The ability to play all four in a row would have been nice. A rolling gallery to music of comic-book style drawings of characters from the film. An engrossing behind-the-scenes look at the creature effects and makeup, including interviews with actor Doug Jones (who plans the Faun and the Pale Man) in the make-up chair, where he describes the Faun suit as the most comfortable he has ever worn. Del Toro explains the reasoning behind his use of specific colour palettes in the film. Four key sequences play alongside the director's thumbnail storyboards and the more polished drawings by storyboard artist Raúl Monge, plus an brief intro from del Toro. A useful look at how closely the final imagery matches the director's intentions, this is one extra that should not even be accessed until after you've seen the film – there are two major spoilers just in how the sequences have been named. Del Toro wanders through one of the main sets waving a small doll on a stick to show the effects crew where to place the Green Fairy in relation to Ophelia. Six short videos and a filmed introduction in which del Toro's own detailed notebooks and drawings are used to show how some key elements were developed from their original concept. All fascinating stuff, but one of the included sequences is actually a look at the constructed miniature of the Underground Kingdom and does not relate to the notebooks in any way, so appears to have been misfiled, so to speak. Once again the ability to play all would have been useful. Del Toro talks about creating a lullaby as the central motif of the music score. Despite its short length, the piece concludes with its own set of scrolling credits. The lullaby in question played and hummed and set to stills from the film. Seven posters for the film. A nifty enough sell that gives nothing crucial away. Three fine transfers, three excellent commentaries and lots of extra features, even if most of them have been recycled from earlier DVD releases. If you don't already own at least two of the titles here then this is a must-have set, or at least would be if it wasn't so expensive. Of course, if the three films were released individually and priced at the top end of the single disc band then you'd be looking at close to £75 for the lot, but for a three-movie box set it's a bit bloody steep, particularly as the 6 disc Blu-ray Alien Anthology retails at £49.99, and if you want to get technical then releasing the discs individually at £24.99 apiece would work out 2p cheaper than this box set. So yes, it comes warmly recommended, but personally I'd either shop around on-line, add it to your Christmas list, or wait a while to see if the price drops a bit. * Since this article was written, both projects appear to have been abandoned, more's the pity.